I haven’t always ben a morning person. I used to be the kind of person who would rather sleep till 11. I always felt like crap when I did it though. I realized that by having great morning habits it would really make me WANT to wake up early. 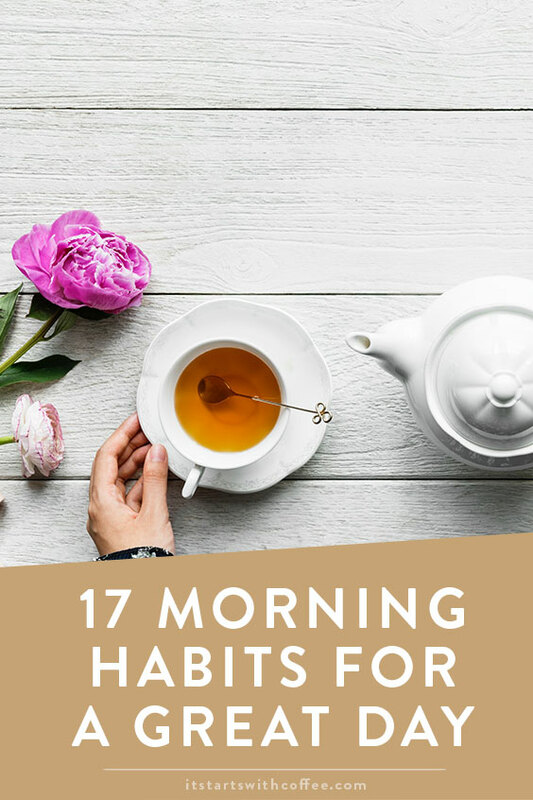 Today I am sharing 17 morning habits for a great day. I think if you are struggling with mornings this will help you! Wake up early: I know I know, sleeping in is the best. Or is it? Do you really feel all that great when you sleep in? Or do you wake up feeling like you’re already running late and then you feel anxious? I do. Wake up early! Start the day off right. Don’t Snooze: The worst mistake. You never fully fall back to sleep and you’re just prolonging the inevitable. Stay Off Your Phone: If you can, try to not look at your phone right away. Instead go ahead and jump out of bed. Get ready: If you are a morning shower person do that. If not: wash your face, brush your teeth, put on makeup if you do, and get dressed. You will feel 100 times more awake. Exercise: If you don’t have to be somewhere right away try to do some exercise. Even a slow flow yoga or a 20 minute walk! Eat breakfast: I hear people say all the time they aren’t breakfast people, but it kickstarts your metabolism! TRYYYYY to eat breakfast. Read: Not necessarily a book but maybe an informative article or just the top headlines of the day. It gets your brain going and then you also know what’s going on in the world for office talk. Check In With The World: Going off the above, check in and see whats happening in the world. I love theSkimm for just this reason. Check Email: Check your email and try to respond to as many as you can so it’s not stressing you out all day! Make a to-do list: One of the best things you can do each day is have a to-do list. I honestly don’t know how people function without them. I would forget my head otherwise. Drink a TON of water: Start the day by drinking a liter of water. I try to drink 32oz before I have any coffee. Pro tip: flavor it with lemon or cucumber for a better, more fun taste. Take Vitamins: I take quite a few vitamins and supplements, but since I started doing that I feel A TON better. Things that were wrong are no longer an issue. Something to look into! Pay It Forward: Buy someone’s coffee, hold open a door. It will make someones day. Snack Healthy: When that morning snack time rolls around choose something healthy: nuts, fruit, yogurt, etc. So much better than something processed. Try to drink another liter of water too! Get ahead: For the rest of the day and the following day. Make your lists, schedule meetings, etc. What kinds of morning habits for a great day do you have? Lots of great tips! I need to get back in the habit of doing my workout early ! This Skimm is a must for me in the mornings as well! Glad to see it made the list! I love the other ideas too! 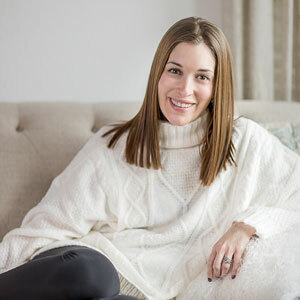 The skimm is a must for me in the mornings too! I’m glad it made the list. I love the other ideas too. I totally agree with these! I start my morning by making coffee and reading a book for 20 minutes before I even touch my phone. Love making a to-do list! And I agree that no screen time right away can really help make your morning! Great post! I love everything you listed, I’ve been loving getting up earlier lately, it makes me so happy to have more time in the day! This is a great post for me right now since I’m really trying to improve my morning routine. I used to always watch something on Netflix while eating my breakfast but it made me super de-motivated to start work so I’m trying to read the news or listen to a podcast instead to get my head in the game. EXERCISE – that is how I start my day on a positive note! And it works like a charm, EVERY SINGLE TIME! I need to start waking up in the mornings. I’m not a morning person but then I wake up at the last possible minute. I rush around and am stressed out before I even leave for the office. It’s such a bad habit! I’d love to know what vitamins and supplements you take. I’ve recently started incorporating vitamins and supplements into my daily routine and I think I’m starting to notice a difference in my energy levels. During the school year at college I wake up early so much more consistently, regardless of how late I stay up. It’s so hard during the summer though! I need to work on it. I do lots of the things you suggested and will be trying out the others. Great ideas! I always drink so much water when I wake up! And I really do try to stay off Instagram for the most part. Cute post! I agree that getting up early is a great habit. If I sleep in I do feel worse, I usually wake with a headache. During the weekdays I’m usually up by 5:30 and on the weekends I turn off my alarms and usually sleep in until 6. This is a good post with helpful advice on things to do. I usually do the same ole thing every day – get a soda and get up out of bed. I am gonna need to start doing some of what is listed here for sure. These are great morning habits! I wake up and do yoga, mediation, then clean up before eating. It’s a great way to begin any day! I struggle to get enough water every day. It’s not that I don’t like it, I just forget to refill my glass! im a morning person…so im nodding my head to alot of these tips..i like my morning routine, otherwise i wouldnt be able to function. I always get up early even if I don’t need to be, it’s the habit my body has. I can’t eat right after waking up. I start the day with coffee and 15 minutes of alone quiet time. I sleep really late and wake up in the afternoon. Its a habit i need to break . Thank you for the great tips. I’ve found that when I don’t check my phone or social media first thing in the morning, my day goes way better and I’m much more productive! Also, sometimes I like to start the day off writing. It helps to clear my mind. I’m such a morning person now, but getting in the habit of not hitting snooze and getting in that morning exercise is key to making loving mornings sustainable for me! Thanks for sharing these great tips, I found that not having my phone in arms reach every morning helps me not check my social media and messages a zillion times before I get out of bed! I am definitely not a morning person what so ever. I have been working on that for over a year now. I am slowly becoming a better morning person. I have added some of these tricks into my routine and they are working. I feel that when I wake up early I get more things accomplished during the day. I think staying off the phone is a great one. I find I’m on mine way too much as it is so I’d like to stay off it in the mornings. I can be a morning person if I need to – for work, etc. – but I do love sleeping in. haha I always get up when the alarm goes off though; I’ve never used snooze before. I also have to take a shower almost right away! I desperately needed this, so thanks! I love a good routine! I definitely have to get my workout in early or it won’t happen! I also use the app, Headspace, to meditate in the morning. It definitely helps with my anxiety. If you’re looking for a good app to help you with habits and routine, Fabulous is amazing! These are such great tips! I think drinking lots of water, smiling and eating a good breakfast are key too. You had me at getting up early haha I was just talking to my husband the other day about how much better and more productive I feel being a morning person as opposed to sleeping in. Sleeping in always made me feel so groggy and it never helped me start my day off right. I also really love starting my day withs some form of exercise. It helps so much in waking me up and easing my body into the day. Yesss, I love to do lists!!! I sleep late nights and wakeup daily 8 am it’s not good for health, you are provided great tips I will try to fallow for my good health. Eating breakfast is so important. I’ve been guilty of skipping it in the morning but I am getting better at that. We have been enjoying summer and sleeping in, but it’ll be back to routine before too long! I need to stay off my phone when I first wake up. I’ll lay in bed on it and it’s a time waster. I’ve got a bad habit of late night sleep & late wakeup. It’s very bad for my health, by seeing your post i can follow the tips day by day to correct myself.